The developments in Ukraine take the most dramatic chatacter. 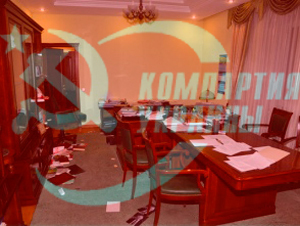 The CPRF International department has got the recent news that in Kiev, the capital of Ukraine, an outrageously behaving gang of well-prepared militatnts attacked the head-quarters of the Communist Party of Ukraine. Unknown bandidts attacked the premisies of the CPU, broke the windows and damaged the furniture inside. According to what our comrades told us there are yet no victims among the communists in the building. The CC CPRF calls upon all the communist and workers’ parties of the world to express their protest agains the orange-brown intervention aimed at breaking the integrity of Ukraine and seizing power by a military coup. We follow the events in the country and as soon as we get the fresh news from our comrades we shall inform the world community and place it on our site and in Solidnet.